Love & Friendship is a pretty bit of film. Generally, it is the British — with a few notable exceptions — who make fabulous renderings of Jane Austen novels as feature films and television miniseries, and we know that the great lady’s stories and characters are as much at home in the 20th and 21st centuries as they were in the 18th and 19th centuries. 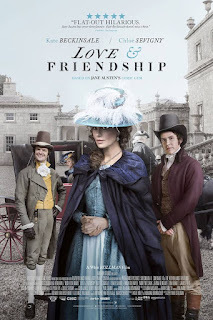 The thing is, I’ve never been a big fan of Kate Beckinsale or Chloë Sevigny and the film Love & Friendship did nothing to dispel my indifference to them as “actors.” In the scenes in which they appeared, I wavered between boredom and annoyance. They were not amusing. When, however, they were either minimal accessories to a scene or entirely absent, those scenes were far more enjoyable and witty. Xavier Samuel was quite at home in Jane Austen’s England as Reginald DeCourcy, son and heir to Sir of the same name, and brother to the wife of Lady Susan's brother-in-law. Reginald is a gentleman with a stick up you know where — until he falls in love with the right young woman, that is, the sweet and soulful Morfydd Clark as Frederica Vernon. Which I suspect is not a spoiler. Kate Beckinsale as Lady Susan, Xavier Samuel as Reginald DeCourcy. Emma Greenwell embodies the sweet character with sense and sensitivity, a totally Jane Austen heroine, Catherine DeCourcy Vernon. Her husband Charles Vernon is that favorite of Jane Austen characters, a stodgy, not terribly bright, but loving and kindly husband, who was simply and beautifully played by Justin Edward. Jemma Redgrave and James Fleet were flawless as Lady and Sir Reginald DeCourcy. Jenn Murray was delightfully horrid in a marvelous Jane Austen concoction, Lady Lucy Manwaring. Tom Bennett was naturally and appropriately silly as Sir James Martin. Ireland substituted marvelously for Kent and Surrey, just gorgeous. Benjamin Esdraffo’s music was just right, as was Eimer Ni Mhaoldomhnaigh’s costume design. 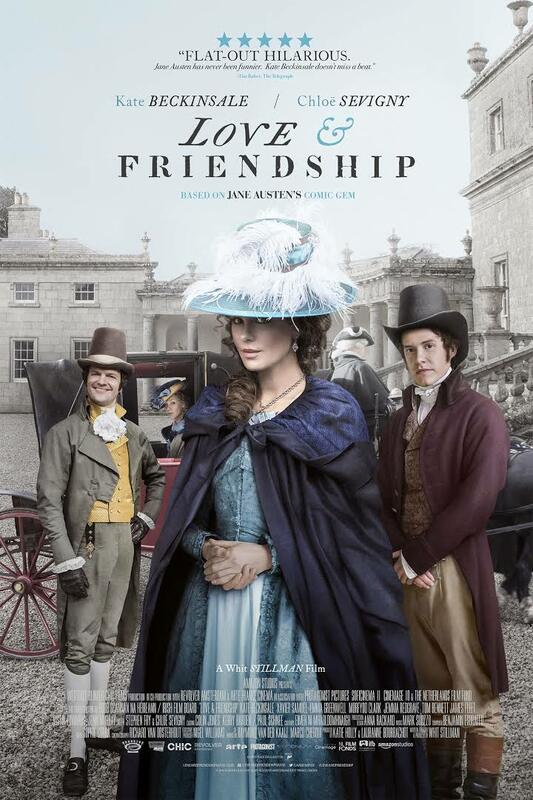 All in all, the film Love & Friendship was fun, but not special. Or perhaps just not as special as I had hoped it would be. Making a film of an epistolary novel is quite a challenge, so the screenwriter /director Whit Stillman gets points for his taste and for even trying. However, it does not quite work, not just because of the dull leads in Ms. Beckinsale and Ms. Sevigny (although it might have been an entirely other film with actors better suited to the roles of Lady Susan and Mrs. Johnson, respectively), but because...well, perhaps it was just those two miscast actors. Or it may just be that letters to script work better on stage than on film… perhaps the reading of the letters with scenes described being played behind the letter-reader until they take over the scene might work nicely onstage.... Good Jane Austen characters will not be kept down. What this film did best was inspire me to re-read the great Jane Austen’s little-known novella, Lady Susan. In fact, why not the entire canon…. ~ Molly Matera, signing off to read books…on paper and in hardcover….